At the end of the Civil War, widow Nancy McCary Sumrall entertained a marriage offer tendered by widower Moses Holyfield. Nancy was 28 and the mother of four young sons. Moses, although inconsistent in reporting his age, had probably entered his seventies. His children from his first marriage were all grown and on their own. Like most of his Piney Woods neighbors, Moses was not a wealthy man. Still, he owned 450 acres of land, of which 80 were cleared for cultivation. He had not been a slave owner, so he suffered no finance losses due to emancipation. Nancy’s husband had died while serving in the Confederate Army in 1862. We do not know how long Nancy deliberated over the matter, nor do we know whether her practical considerations and emotional sentiments were in harmony or in conflict. What is known is that in due course Nancy accepted Moses Holyfield’s proposal and became his bride. Marriages between men of advanced years and women several decades their junior did not begin in the wake of the Civil War. Throughout the nineteenth century women bore the burden of frequent pregnancies that often began in their teens and—if their health, endurance, and luck proved sufficient—might continue for another three decades. If any of these attributes failed them, their death usually necessitated the search for a new wife; preferably one still comfortably within the range of childbearing years. Second and third marriages resulted from a pragmatic understanding of the workload required to maintain a household in a subsistence level economy. The death of a wife left children without a mother in an era when children attended privately operated schools only sporadically, if at all. In addition to child care, women performed an array of essential functions: cooking and cleaning, making of clothing and numerous household items such as soap and candles, and cultivating vegetable gardens. If there were no daughters old enough to assume these duties, the absence of a wife would be keenly felt. This was true even in the higher realms of Piney Woods society. Slave owner Isaac Anderson was among the wealthiest men in Jones County when his wife Teresia Powell Anderson died in 1850. After a decent interval, the widower Anderson set about courting Sarah Rebecca Deason, the daughter of a local merchant with whom he was well acquainted. Two years later, the sixty-six year old Isaac had successfully won the hand of twenty-three year old Sarah Rebecca. The toll the Civil War exacted upon the male population of the South had a discernable, if not necessarily radical, impact on the institution of marriage. In 1870 Jones County contained 449 white females between the ages of 20 and 40, compared to only 332 males. And within this reduced pool of men, it can be assumed that some portion had lost limbs or otherwise been seriously impaired by the war. Despite these obstacles, Piney Wood women, whether single or widowed, could and did marry local men during the Reconstruction era. But in order to do so, many had to revise their concepts about what constituted a suitable domestic partner. Nancy McCary was born in Alabama in 1837. Her parents, Tandy and Cloah McCary, were both natives of South Carolina. The birth states for their children indicate that around 1843 the McCary family moved across the state line to Wayne County, Mississippi. Nancy became the bride of Elisha Sumrall in1852 when she was 15 and he was 21. The location of the couple over the next decade is unknown. But later records reveal that Nancy gave birth to at least four sons: Benjamin (1854), Theodore (1856), James (1858), and Jefferson (1861). The question remains as to whether the Jacob Sumrall (1852) who later married Martha Rushing Walters was the eldest son of Elisha and Nancy (see part two of Jones County Widows). Like many other men having a family to support, Elisha did not join in the first wave of Confederate volunteers in the spring of 1861. On March 26, 1862, however, he enlisted in Company I of the 36th Alabama Volunteers and was dispatched to Mt. Vernon Arsenal, outside of Mobile. There his military service came to an abrupt end on June 4 when he died, probably of a camp disease, a scant two months and 10 days after his enlistment. On October 17, 1862 Nancy filed papers to obtain his back pay. A Confederate paymaster computed the amount due as $50.66. The request made its ponderous way through the war time bureaucracy until, on November 28, 1863, approval was granted by the Comptroller’s Office. Nancy signed a receipt for the payment on January 15, 1864. During the interval while she and her children waited, Confederate currency had suffered an inflation rate exceeding 700%, rendering her settlement essentially worthless. Sometime after receiving her token payment, Nancy moved to Jones County. She may well have sought to remove herself and her young sons from harm’s way. The Mobile and Ohio Railroad, which passed through Wayne County, held strategic value for both armies. Jones County was devoid of railroads and had a sizable community of Sumrall in-laws, making it an attractive haven. In her new surroundings Nancy made the acquaintance of Moses Holyfield. He had been born in South Carolina, probably circa 1796, and moved his family to Jones County in the 1830s. Based on the 1840 and 1850 censuses, Moses and his wife Milly had seven sons and one daughter. By 1860, the only child remaining in the household was a grown son named Mark, age 33. Although Moses did not own slaves, evidence indicates he felt strongly about the secessionist cause. On May 4, 1861 he enlisted in the 8th Regiment, Mississippi Volunteers at Ellisville and traveled 57 miles to the rendezvous point at Enterprise. Upon ascertaining that Moses was 65 years old, the officers doubtlessly saluted his determination and vigor, but sent him home. Millie Holyfield, who was approximately the same age as her husband, died towards the end of the war. This left Moses facing his final years with a sizable farm and an empty house. If the growing number of young widows around him did not fill Moses with delight—since each widow suggested the role attrition was playing in determining the final outcome of the war—at least it made him aware that his prospects for another marriage had been greatly enhanced. What may well have encouraged him to initiate a courtship of Nancy was not just her youth, but the prospect of welcoming her four boys into his household. As mentioned previously, Moses Holyfield had carved out a modest yeoman’s existence. In 1870 he possessed 80 acres of crop land, with another 100 acres in pasture and 270 acres of woodlands. His livestock holdings were small for the region: six cows, seven sheep, and 10 pigs. The previous year the farm had produced 100 bushels of corn, 75 bushels of sweet potatoes, and a cash crop of two bales of cotton. His farm clearly stood to benefit from the additional labor of four young stepsons. The census of 1870 captures the transformation taking place within the Holyfield household. Moses gave his age as 75 while Nancy stated she was 32. Her sons ranged in age from nine to 16. With them was 14 year old Richard Holyfield, a young relative of Moses, working as a farm laborer. In addition, Moses and Nancy had started a new family, consisting of son William, three, and a six month old daughter named Mary. For Moses it could truly be said that life had begun, again, at 70. Nancy must have understood when she agreed to the marriage that it would not be a long term relationship. Moses died in the mid-1870s and Nancy again found herself a widow, having added three small children to the household (another son, Charles, had been born in 1874). But, owning to her second marriage, her circumstances were more secure. The interlude with Moses had provided time for her sons to reach manhood. Although sons James and Jefferson remained in Nancy’s household in 1880, they were leaving their teens. Their older brother Benjamin, married and a father, lived next door. Having regained some security in her life, for perhaps half a decade Nancy remained single. When she did marry again, it was in the fall of 1883 to Carney Slay Sumrall, a man who had lost his wife four months earlier. The Sumrall’s were among the early settlers in south Mississippi. Patriarch Thomas Sumrall was born in South Carolina in 1740 and died in Marion County in 1821. He was the great-grandfather of Elisha Sumrall, Nancy’s first husband. (This line descended from son Levi Sumrall and his son Jacob Sumrall, who was Elisha’s father.) He was also the great-grandfather of Carney Slay Sumrall. (This line descended from son Moses Sumrall and his son Howell Sumrall, who was Carney’s father.) Thus Carney was a second cousin of Nancy’s first husband. There may have been a closer connection linking the couple: some genealogies give the maiden name of Carney Sumrall wife as Catherine (‘Kitty’) McCary. This matches the name of Nancy’s older sister on the 1850 census. Carney Slay Sumrall, named after a Wayne County Baptist minister, was born in 1830. He was a Confederate veteran who had enlisted in Company E (the Shubuta Guards) of the 37th Regiment Mississippi Volunteers on March 8, 1862 at age 32. Unlike his cousin Elisha, Carney seemed able to cope with camp life, suffering only one recorded bout of illness. Although records are sketchy, they suggest he took part in the siege of Vicksburg and was paroled. He is documented as having surrendered with his unit at Citronelle, Alabama on May 11, 1865. He returned to farming in Jasper County where, in 1870, he was enumerated with his wife and a daughter named Mary. By 1880 he had moved to the small Jones County community of Pinelville, where he and Catherine scratched out a merger existence in a childless household. Catherine died in May of 1883 and soon thereafter the new widower must have begun calling on Nancy Holyfield. Carney Sumrall appears to have ranked below the widow Holyfield in terms of economic status. He reported the value of his 1879 farm production as $95, paltry even by contemporary Jones County standards. But Nancy may have reached a point where she could afford to let sentiment play a larger role in her decisions. On September 17, 1883 Carney Sumrall and Nancy McCary Sumrall Holyfield applied for a marriage license and solemnized their vows six days later. At the time Nancy was 46 and Carney 53. She was leaving her childbearing years behind and may well have looked forward to a long marriage. If so, it was an unfulfilled wish. Just six years later, on December 12, 1889, Carney Sumrall applying for another marriage license—this time to Elizabeth Hinton Coats. The absence of any divorce proceedings in the surviving court records indicates Nancy had died. Although some genealogies list her as dying in November of 1902 and being interred in Wayne County, they have apparently confused her with another Nancy Sumrall, born in 1847, who was the wife of Enoch S. Sumrall. In wedding Elizabeth Coats, Carney had once again chosen a Civil War widow. Born in 1838, Elizabeth Hinton had been the wife of Thomas N. Coats. He, like other married men facing conscription, enlisted on May 12, 1862 and was mustered into Company F of the 7th Battalion Mississippi Infantry. He also participated in the siege at Vicksburg and, following its surrender, was paroled. A muster roll in the Mississippi Archives indicates Thomas N. Coats went absent without leave from January 3 until April 10, 1864, during which time Elizabeth became pregnant with their third child. Five days before Col. Lowry led troops into Jones County to deal with the deserters, he rejoined his unit. Thomas was subsequently captured on July 4, 1864 at the battle of Kennesaw Mountain, near Atlanta. From there he was shipped north to Camp Douglas, Illinois where he died of pleurisy on February 9, 1865—three days after his fellow Jones Countian George Warren Walters had died in the same camp. (see part two of Jones County Widows). Perhaps unwilling to loosen her standards regarding potential suitors, Elizabeth remained a widow and reared her three children. Twenty-four years elapsed between the death of her husband and her acceptance of Carney Sumrall’s proposal. Carney and Elizabeth were last enumerated on the 1900 census. Elizabeth died in July of 1902 and was buried in the Union Line cemetery near Soso. In May of 1907 Carney was admitted to Beauvoir, the former gulf coast residence of Jefferson Davis that had been converted into a Confederate retirement home. But he later discharged himself and returned to Jones County, where he died in 1909. His grave is beside that of wife Catherine in the old section of Hickory Grove cemetery in Laurel. The author has been unable to locate the grave sites of Moses Holyfield and Nancy McCary Sumrall Holyfield Sumrall. It is known that Nancy’s sons by Elisha Sumrall continued to reside in Jones County until their deaths in the 1920s and 30s. 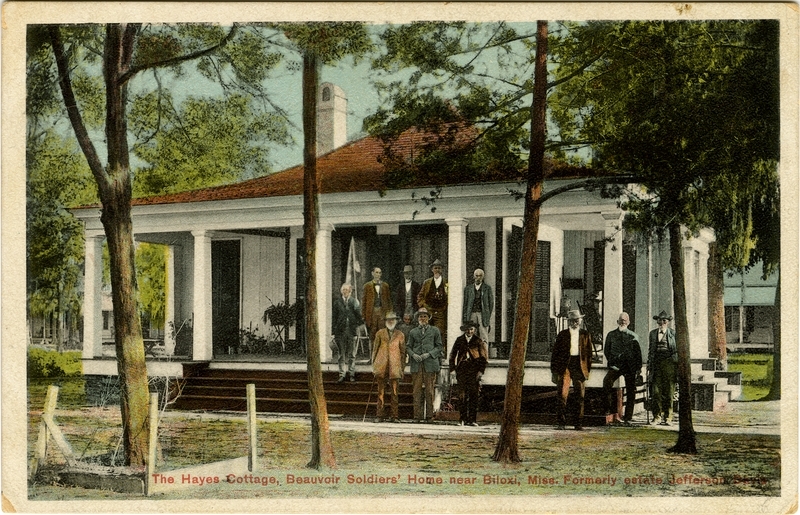 Hayes Cottage, Beauvoir Soldiers Homes, Biloxi, MS, where C. S. Sumrall once resided. Nancy McCary Sumrall and Elizabeth Hinton Coats demonstrate how two Piney Woods women, eventually fated to marry a common husband, reacted to their status as Civil War widows. When given an early opportunity to re-marry, albeit to an elderly man, Nancy accepted the offer as a practical partnership necessary to sustain her family through difficult times. We can surmise that Elizabeth was less inclined to make such compromises, with the result that she retained her widow’s status for two dozen years after the war. Whether accepting or rejecting prospective mates found among the reduced pool of post-war men, however, both women coped with the circumstances life had presented them. I just wanted to let you know how much I’ve enjoyed reading your historical accounts. You have proved to be a talented writer! A skill that I very much appreciate. (Side note here:) I have no direct ancestors who settled into MS, but do have ancestors of this era who lived in Eastern Kentucky. (Carter Co KY) Some years ago, I concluded that the majority of marriages from this era took place as a means of mutual survival. You validated my conclusions in your last paragraph. But unlike my plain writing style, you clearly demonstrate your talent for penning great prose. Vikki also belongs in this top league. At best, I’m merely an appreciative reader. Ed, I do Thank you! You are welcome, Vikky. The posts in this series deal with a group of women who, like Nancy, were mostly illiterate. Thus they left us no records of their thoughts. Indeed, they typically only left faint documented traces from which I’m attempting to reconstruct a portion of their lives. I continue to hope one of them dictated some letters to relatives in, say, Texas that might come to light. In any case, we can’t say that people whose marriage bonds were based on pragmatic needs did not develop sincere affection for one another that may have been stronger than the romantic attractions of our current age. Mary age 8 , Ala.
“I am a descendant of Benjamin McCary(s/o Tandy) and wife Margaret Summerall through their daughter, Martha McCary who married Daniel Cicero Williams in Wayne Co., MS circa 1879/80. 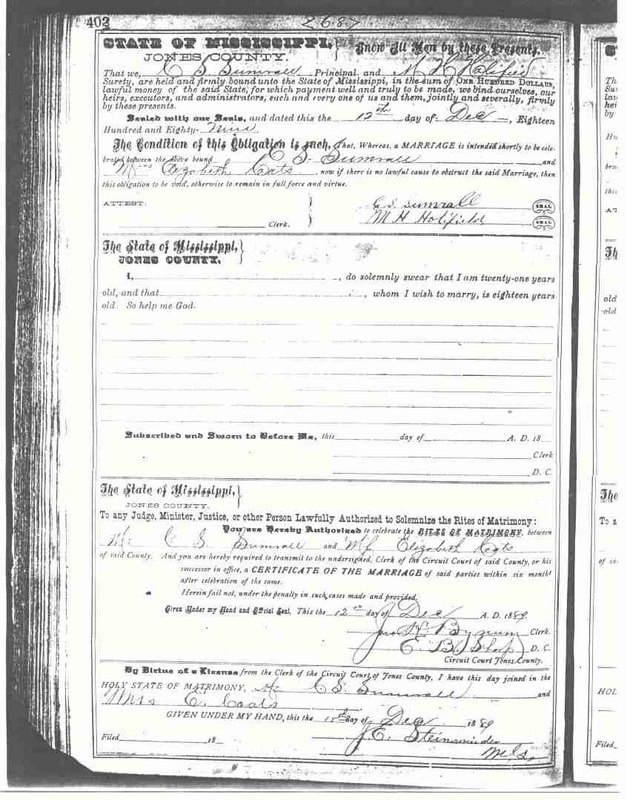 See census of 1880 Wayne Co., MS. Do you have more information as to why the family was broken up just after the Civil War? Was Benjamin killed in the war? Martha went to live her grandparents, Jacob Summerall, I believe. Margaret was the daughter of Jacob Sumerall and Mary Friday Choctaw Co. Alabama and then Wayne County, MS. She married Benjamin McCary (son of Tandy McCary) in the early 1850s. It sure seems those Sumralls were related by blood or marriage to a lot of the Jones County people – I wonder if maybe the Holifield/Holyfield family was also somehow related. I had earlier written asking you when Laurel was established, as I found it curious that Jacob Sumrall’s daughter Martha Elizabeth told me that her dad’s family came to Texas from “near Laurel in Jones County”, yet it seems Laurel was “established” in 1882, while Jacob and his family came to Texas in the 1870’s. That could indicate that the Texas family maintained contact with some family back in Mississippi after Laurel was established. Or maybe the community had always been known as Laurel. Thanks again for a fascinating history lesson. Ed, your mention of the Mobile & Ohio Railroad which runs through Wayne County reminded me of this information I picked up somewhere, don’t remember where or when, about a Jacob Sumrall in Clarke County – don’t know whose line he belonged to, there seems to have been many Jacob Sumralls around back then. I wonder if you are familiar with this house and history? Circa 1859 – Greek Revival vernacular, 175 County Road 253, north of Shubuta on Highway 45. The house was build by Jacob Sumrall; a railroad man living in the area after the Mobile & Ohio Railroad was established in 1855. His family is said to have lived in boxcars until this house was completed. The site became a community center and was known as “Sumrall Switch” because the train would stop here to offload groceries distributed from a store behind the house. The Sumralls had a brick kiln and ground their own feed. Their place is said to be the site of the first church and school in this vicinity. Good story. I knew lots of Sumralls and Holifields (i instead of y) while growing up in Jones Co. As you know, there were a lot of Mauldins there also, mostly descendants of William Harrison Mauldin who homesteaded the farm I grew-up on in 1850. William raised 18 kids in the 2 room log cabin he built, one being my GGrandfaather Lemuel Harrison Mauldin. But I have just discovered some shocking news for the Jones County Mauldins. I just took the Ancestry.com DNA test and found that William Harrison Mauldin and all of his 100s (maybe into thousands now) descendants should have the last name of “Smith.” A Smith broke into the Male DNA line about 225 years ago, in Pendleton District, SC (Anderson, SC). It was either Harmon Smith or his father Christopher (Kitt) Smith. I am betting on Christopher because he was one cool dude and left a wide swath. But, I am trying to piece the fragments together while maintaining provable lines. Intersesting stuff. Would you be willing to share your info about Mr. Smith? He may be my great great great grandfather. My grandmother was Leona May Mauldin Patrick 1909-1977. 1) Most histories do cite 1882 as the establishment date for Laurel. However, there were older settlements in the area, the most notable of which was Pinelville. Hence, as Laurel grew it was natural for people to say they or their parents had lived “near Laurel” (well before its founding) rather than referring to some crossroads community with which most people would not be familiar. 2) Both “Holifield” and “Holyfield” spelling were used in 19th century Jones County. I chose “Holyfield” for Moses because that is the spelling most frequently associated with him. 3) It is very likely that there were other connections between the Sumrall and McCary families. After all, this was the Piney Woods. For example, I found a land deed from 1871 in which Moses Holyfield sold a 60 acre parcel near Pinelville to “Mrs. Kitty Sumrall” for $100. This is a further suggestion of a connection between Kitty and Nancy, who I suspect were sisters–my assumption being that Kitty was the Catherine McCary, age 16, on the 1850 census report Tim cited. It is interesting the land was sold to Kitty rather than to her husband, Carney. This property (near Pinelville) seems to be where the couple resided in 1880. Carney later homesteaded 160 acres near Soso. His property there adjoined that of widow Elizabeth Hinton Coats, whom he married in 1889. I’ll check on any Civil War records for Benjamin McCary. Some follow-up information about BENJAMIN MCCARY, brother of Nancy McCary Sumrall (et al): it appears this was another case of a brother-sister in one family marrying a sister-brother in another family. Benjamin married Margaret Sumrall while his younger sister Nancy married Margaret’s older brother Elisha. Both marriages seem to have taken place circa 1852. I’ve found no evidence (yet) that this Benjamin McCary died as a result of service during the Civil War. Benjamin and wife Margaret were last documented on the 1860 census in Choctaw county, AL with their five children. Some Ancestry Public Trees associate him with the service records of a B.H. McCary who served in the 29 AL Infantry, Co H. But a much better claim can be made that this soldier was Benjamin H. McCary of Bibb County, AL. He can be found there on the 1860 census in the household of his parents, Martin and America McCary. He was captured in Nashville, survived imprisonment at Camp Douglas, IL, and then returned to AL where he died in 1922. TANDY C. MCCARY was born 1 Jul 1854. After the 1860 household census, he next appeared on the 1880 Wayne County census. He remained in Wayne County until his death, per his tombstone inscription, on 21 Dec 1928. COLUMBIA ELIZABETH MCCARY was born 1 Dec 1855. She also re-emerged on the 1880 census for Wayne County. But other records show she had married Neil A. Kelly in Washington County, AL in 1873. She re-married to Stephen Lee Murphy in 1879. The couple moved to Jones County. Columbia died, age 93, in Bay Springs on 7 Dec 1948. MARTHA MCCARY is the only child I’ve found on the 1870 census, living in the household of her Sumrall grandparents (Jacob and Mary). She had been born, per her death certificate, on 26 Jul 1859. She married Daniel C. Williams in Wayne County in Jul 1879. The couple moved to Forrest County where Martha died on 27 Aug 1921. I would appreciate any info you have on Columbia McCary. Sh is my grandmother Ouida, mother. Thank you! I get dizzy and confused with all the Elishas and Jacobs in so many different generations and so many degrees of relation, but thought someone could make use of this and determine just where this Jacob Sumrall fits in. In addition to the three children of Benjamin McCary listed above that grew to adulthood, I have information that their daughter Chloe, aged 8 in the 1860 Census of Choctaw County, MS, appears later in Jones County, MS as the wife of Joshua O. Holifield (imagine that). There are a lot of folks on Ancestry.Com that give her name as Chloe Salina McCary and claim that she was born 30 June 1852 in France, but that just doesn’t stack up with the Jones County, MS, census records. The date may be right, but she was clearly born in Alabama. Joshua and Chloe’s daughter Mary Catherine married Gillis Pinkney (“Pink”) Temples and they removed to Franklin Parish, LA, where they eventually become great-great-grandparents to country music star Tim McGraw. Now isn’t that interesting? Very interesting, indeed, Michael Hurdle! Thanks for sharing that information. I enjoyed ALL DATA, I am the granddaughter of Poline Sumrall who’s men relatives were Jeff and Willie Sumrall buried at Clark cemetery, Jones county Ms. OFF LOWER Myrick Rd. My grandmother Poline is buried at the Myrick cemetery, Laurel, Ms. She married George Brown Morgan.. Poline’s sisters were Sally, Minnie, Susan Sumrall. many relatives to her were DUNAGIN’S & Clarks. NOT SURE HOW THOSE ARE SPELLED. SUMRALLS BURIED AT CLARK CEMETERY, JONES COUNTY, MS.
All these people were born in the 1800’s. Would you have any information on Thomas and Lavinia Collins Williams in your databases? Thomas Williams was born 1838 in MS. He was on the 1840 Clarke or Wayne County Census with his father, Sampson Williams, as the head of the household. He was on the 1850 Lauderdale County with his Mother Elizabeth Williams as the head of household.. He was on the1860 Clarke County Census as 22 yrs old and Lavina Williams 18 (born 1842) and Levise Colling (believe it should have been Collins) as the head of the household. They appear to be married living with her Mother. They had two children and the children are on the 1900 Beat 4, Jasper County Census. O. Williams is the head of the household and I believe the O is for Oliver. Oliver is married to Annie Hosey and Oliver’s sister M.L. (Mary) Williams is living with them. Thomas Williams is believed to have died in the Civil War as a Confederate. His brother John Wesley Williams and nephew Allen P Williams was in the 1 MS Cav Reserves, Co H but Broadfoot Publishing could not find anything on Thomas Williams. Thats about all I have, but would like to learn more and wondered if Lavenia Collins is connected to Sarah Collins, Jasper Collins or the others. I’d also like to learn more about Thomas Williams service in the Confederacy. I have no reason to believe he was a Southern Unionist but don’t rule anything out. Oliver Williams is buried in the Union Seminary Cemetery, Moss, Jasper County, MS and his headstone is in Find A Grave. If any of this information matches up with something you have I would appreciate any information or advice you can give me. Thanks! It’s nice to hear from you after so long a time! In response to the interesting info you provided, I checked my Collins files for any mention or listing of a Lavina, but found none. The geographic connections are certainly close enough to indicate a relationship, and there may indeed be one within some of the Collins branches that I have not researched extensively. Perhaps another reader can add additional information that will shed light on Lavina Collins Williams and her Williams descendants. There is a 1850 census record for Joseph Collins and wife Lavina (sic) Collins in Wayne County. Among their 5 children is a daughter also named Lavina, age 8. This would seem to match the “Levise Colling” and daughter “Levina Williams” whom you located on the 1860 census. On the 1850 census Joseph Collins reported being born in North Carolina ca 1790. He apparently moved to Mississippi sometime prior to 1830, since a match can be found in Wayne County on the 1830 and 1840 censuses. Wayne county tax records could probably help clarify when Joseph arrived in Mississippi. In 1830, there were 3 Wayne County households headed by Collins males: Jacob, Joseph, and Robert. Whether there was any kinship connection among them is unknown to me. After the death of Thomas Williams, his widow Lavinia re-married to Jeremiah Gregory (Find-A-Grave listed a “Jeromier Gregory”). She died in 1884. Both she and her second husband are buried in the Mt. Pleasant Cemetery, Stringer, Jasper County. One of the Find-A-Grave memorials cites Lavinia Collins’ mother’s maiden name as Lavinia Hetherington. It would appear that if Joseph Collins was related to the Jones County Collins clan, it was a distant connection. My initial check of the Fold3 military records did not find a match for this Thomas Williams, but I do some more digging. Thanks for helping Jan out, Ed! I have researched Moses Holifield for many years because it is said that his first wife was Millie Rivers, daughter of Mark Rivers and Annie Parker. The RIVERS lived in Chesterfield,County, SC. In 1820 Moses Holifield is listed in the Census for Anson County, NC just across the state line from Chesterfield. 1820 U S Census, Anson County, North Carolina, Population Schedule, Huntley, Anson County, North Carolina, page 33, Line 22, , Household of Moses Holyfield. Moses and Millie were married sometime around 1815-1817; in 1830 they are listed in the Chesterfield Census. 1830 U. S. Census, Chesterfield County, South Carolina, Population Schedule, Chesterfield County, South Carolina, page 244, Line 19, Household of Moses Holifield. They moved to Jones County, Mississippi before 1840. Millie Rivers Holifield died between 1860 and 1867. If anyone has any additional info on this couple; please contact me. I need some help with these Sumerall/Sumrall lines, if anyone can help. I’m the daughter of Roz Morgan Newell who posted on here in 2010 about our Poline Sumrall Morgan b. 1890, Jones County MS. We have always known her as Mary Pauline Morgan who married George Brown Morgan of Myrick Community, Jones County, MS, but I have seen her listed on a census as Poline rather than Pauline. Anyway, we have tried for years to find our Pauline’s family and have gotten nowwhere. Just last night I found on a census where a James Sumrall b. 1860 and approximately 70 years old was residing with Pauline and George and their son John, my maternal grandfather. Now, Mother has thought perhaps Pauline’s father’s name was Jeff. Interestingly, this James Sumrall has a brother named Jefferson. Mother has a copy of a report card for Pauline signed by J. Sumrall – could be James or Jefferson, but based on the census, I’m “assuming” James Sumrall was my great-great grandfather. The problem is, I can find children listed for other members of the family but haven’t found a list of any of the children of James I. Sumrall and his wife Mary Alice (last name unknown but “may” be Carter?). In fact, I found mention that there are no records for his descendants. I can’t help but wonder why there is so much information on all the others and nothing on his. But there is no Pauline/Poline listed as a child of Jefferson Sumrall and since James was living with Pauline in his old age, it seems reasonable he was her father. It would mean so very much for us to finally be able to identify our branch of the Jones County Sumrall lines and know who are kin are!!! We do know from the marriages of Pauline’s sisters that coming forward their allied lines include Stringfellow, Stribling, Lomax, but it’s the family connections that these sisters came from that we so desperately seek. Pauline’s sister were Sally, Minnie Corine m. Luther Ernest Stringfellow, and Susan. If there were other children, I’m not aware of it. ANY help with this branch of the Sumralls would be greatly appreciated!! The 1900 census records for Jones County show Pauline Sumrall as the 11 year-old daughter of James and Alice Sumrall. Indeed, that census listed 3 sons of Nancy McCary and Elisha Sumrall (Jefferson, James, and Benjamin) in adjoining households along with their wives and children. Since all census records from 1890 were destroyed in a fire, this is the best single source for grandchildren of Elisha Sumrall. The children enumerated along with James and wife Alice were: son William (b Jul 1881); daughter Vilindy (b Nov 1887); dau Pauline (b Feb 1889); dau Sallie (b Sep 1891); dau Minnie (b Feb 1895); son Thomas (b Dec 1897); dau Bernice (b May 1900). Alice reported having given birth to 9 children of whom 7 were still living. This coincides with the fact that 7 children were enumerated. The 2 deceased children would explain the gap between the birth of William in 1881 and Vilindy in 1887. The 1910 census showed children Sallie, Minnie, Thomas, and ‘Tina’ (aka Bernice) still living in the household with their parents. Oh, Ed, I can’t thank you enough! I got tears when I read this. This nails it down completely and ties us in to all the wonderful history you have shared on the family! I’m SO happy to finally know who we came from on this branch of our family that has eluded us all these many years! Again, thank you so much! You just made my day and I can’t wait to share this with my mother and cousins! Debbie: Although the genealogy posted with the grave stone indicates this to be Nancy McCary (Sumrall > Holyfield > Sumrall), I believe this is the grave of another Nancy Sumrall — the wife of Enoch S. Sumrall. As noted in the article, records show that the twice widowed woman born Nancy McCary married Carney Sumrall on 17 Sep 1883. There is no indication of Nancy and Carey divorcing, yet Carney married widow Elizabeth Hinton Coats on 12 Dec 1889. From this I surmise that Nancy McCary (et al) died some time prior to 1889. Both Enoch and Nancy Sumrall are listed on the 1900 census in Wayne County. Meanwhile, Carney Sumrall and second wife Elizabeth are found on the same census in Jones County (Ancestry transcribed the couple of “Casey Sumerall” and “Elizabeth Sumerall”). Oh well, another case of misleading info on the internet. I thought surely I had found where she’s buried! Thanks for clarifying! Ed, The Baptist preacher who Carney Slay Sumrall was named after was Rev William Carney Slay (1802-1863), who is a 1st cousin 5x removed. I believe William Carney’s parents were Nathan N and Nancy or Martha Sumrall who I believe was the daughter of Thomas (1740-1821) and Ann Thomas Sumrall (I don’t have it nailed down yet). Thomas and Ann are my 5th great grandparents. William Carney’s first wife was Belinda McDuffie with whom he had at least 7 children. After Belinda’s death in 1850 he married Elizabeth Shoemake(r) with whom he had at least another 5 children. William Carney and Elizabeth Shoemake(r) Slay are buried in the Mount Zion Baptist Church Cemetery in Wayne County. I have not been able to connect Elizabeth to my Shoemake line but believe if there is a connection it goes back to TN, SC or VA.
Chuck: Thanks for the additional information on the Sumerall and related families. To Ed Payne and other Sumrall researchers some updated information I just found again yesterday. In May 1961 I made my first (and last until recently) foray into genealogy. I visited the national archives in DC and they pulled up the microfilm for Jones County Ms 1860 and 1870. Since I was only interested in the Sumrall name, and variations, I copied only information containing those names. The 1860 census record from the archives was headed: “Census of Jones County, Mississippi, July 25, 1860 – Post Office Ellisville” and listed 8 families: Greenberry Sumerall, Thomas V. Sumerall, Henry Sumrall, John Sumrall, Thomas Sumerall, Henry Sumrall, John Sumeral, and H. L. Sumerall. No Jacob or Elisha Sumrall. It’s possible Martha’s children by her first husband were also listed but since I was only concerned at the time with the Sumrall name I wouldn’t have written down the information if they were named Walters, as I didn‘t know the connection. “I never knew any of the Sumralls, only my father and brothers, just heard my father tell very little and as you figured his father was killed during the war. BORN May 11, 1873. Then Martha Walters died and Jacob marked LUCY JANE WILLIAMS 1876 and MARTHA ELIZABETH SUMRALL BORN 10 year later FEBRUARY 20, 1886. Timothy Sumrall’s great-grandfather ELY THEODORE and LENORA ROUNTREE were married in Blanco County Texas – think it was 1892. The rest of number 8 of the 1870 census are all brothers of JACOB SUMRALL. He and Lucy Jane visited Laurel in 1910. JACOB had an uncle THOMAS F. SUMRALL there at this time (perhaps this is the Thomas V. at number 4 of 1870 and 2 of 1860). Sumrall, Jacob	18	farmer	Miss. Holifield, Moses	75	farmer	S.C.
Nancy	32	keeping house	Ala. I think this establishes pretty conclusively that Jacob was the brother of the 4 Sumrall boys listed in the Ancestry census as living with Moses and Nancy Sumrall Holifield. In the space of about a month Jacob’s brothers were listed in two different locations – maybe they were visiting one or helping out on the farm? Does anyone have an idea of how to find the earlier June 21, 1870 census, why there were two records and how to correct or add the national archives record to the Ancestry file? I would like to correct and add this information for future researchers as it contains more accurate information related to this Jacob Sumrall. Thank you so much, Tim, for sharing all this great information from your files. Tim, thank you for this additional information. I was able to fill in some gaps and able to add your line to my tree. We’re 4th cousins. Not all of us are able to travel and search archives, so it’s wonderful when someone who has shares the data and gives us documentation. Thank you for all your efforts on the Sumrall lines and for sharing with us. Like Vikki, I want to thank you for this information which — as you noted — provides credible evidence that Jacob Sumrall was the elder brother of Benjamin, Theodore, James, and Jefferson Sumrall. As regards census dating: census takers were given an official enumeration date. Although the actual canvassing of a county took place days or weeks after this date, the census taker was supposed to collect information based on the household composition as it was on the official census date. For the 1870 census, this date was June 1. I’ve found several instances where memories failed and the same persons were recorded twice because they had relocated between the official census date and the date when the census taker arrived. If you are interested in the written instructions that census takers were expected to follow, the link below provides the instructions for the 1870 census. Have you found any clues that would narrow the time frame for which Moses and Nancy were married after the War. Was it immediately, in late 1865 or is “just after the war’ all that is known?. The marriage records for Jones County available at the Mississippi Archives begin in 1882. My description of the marriage of Moses Holyfield and Nancy McCary Sumrall as occurring “just after the war” is meant in relative terms. The 1870 census listed the first child of Moses and Nancy, William Martin, as age 2, In practical terms, this meant that on the enumeration date of 29 July 1869 his age fell somewhere between 2 years and 2 years 11 months. From this I deduced the marriage most likely took place circa 1865-1866. Thank you so much for the incredible information on Nancy McCary Sumrall Holifield Sumrall. It put so many pieces of a confusing puzzle together. I’m wondering if you have any information from all of your research to locate accurate records on Benjamin R. Sumrall, son of Elisha and Nancy Sumrall? Specifically a death date and burial location. I have visited the Archives in Jackson and found nothing on Benjamin R. Sumrall. Benjamin R Sumrall and Mary Ann Holifield Sumrall are last seen in the 1920 census. Mary Ann died in 1924 but no records for Benjamin R. were found. Can you offer any suggestions to locate Jones County obituary records for 1920 through 1924. (Mary Ann is shown as a widow on her death certificate in 1924. An obituary is a reach since I couldn’t find the record at the Archives. Any assistance (or research suggestions) you could provide is so appreciated! This will not only help our family find a missing puzzle piece but it will help many others as well. Thanks for your comments. I’m not sure I can be much help on Benjamin R. Sumrall. Based on the 1920 census and the death certificate you found for his wife Mary A. (Holifield) Sumrall, it would appear Benjamin died between 1920 and 1924. Odd that you did not find a death certificate for him during that period, but it’s been known to happen. I saw that the contemporary with whom he is sometimes confused, Benjamin Franklin Sumrall, died in 1923. I tend to go with birth years listed on the earliest censuses since, in those days, people got more haphazard about their age as time went on. Still, I note that by the 1920 census, Benjamin reported an age consistent with the year of birth given in 1870 (= 1854). Your mention of the death certificates of Mary Sumrall and son Ellis Buford Sumrall citing their burial at “res Myrick.” This suggests to me that they were buried on family land — and it is reasonable to suppose Benjamin would have been interred there as well. The question is whether there are any records of a Sumrall family plot in the Myrick area. I assume you checked the 3 volumes of cemetery transcriptions at the Archives (as I recall the volumes are divided in to North, Middle, and South Jones County). The markers may be long gone, but you could try to find the location of Benjamin’s residence and farm in the 1920s. Thank you so much for your speedy reply! Land records and another visit to the Archives is the plan. I’m impressed at your incredible knowledge and that you are so willing to help others with research. I’m reassured with your information that I’m at least on the right path. Thank you doesn’t seem adequate but THANK YOU!! I had my DNA test done earlier this year and I have a match with a Sumrall descendant who only has her line traced back to Jessie Marion Sumrall and wife Clara Jane Brownlee. Most searches I’ve done to try to find the connection since we’re DNA related have no parents found for Jessie, except one site that said he was likely the son of Benjamin, son of Elisha and Nancy, and his wife Mary. I can’t find a listing of children for Benjamin and Mary Ann (Holifield) Sumrall. Do you know if they had a son named Jessie Marion b. 1880? The records I have do indeed have a son Jessie born in 1880 to Benjamin R and Mary Ann Sumrall. There is a lot of confusion because of another Benjamin R Sumrall. I feel fairly confident in the records I have found that includes census records. I’ve also found actual headstones for a lot of the family. I’d be happy to share the details I have if you would like. Send a message directly to DeLaney.busby@yahoo.com. One of the challenging (or exacerbating) things about genealogy is dealing with two people with the same name, born around the same time, and living in the same general locale. Two men named “Benjamin Sumrall” can be found on the Jones County censuses of 1870-1920. One seems to have been the son of Harmon Levi Sumrall and Bethany Shotts. He was born ca 1852 and his full name was Benjamin Franklin Sumrall. He married Sabra Jane Collins. The other Benjamin Sumrall (middle initial possibly “R”) is found on the 1870 census in the household of Moses Holifield and wife Nancy (McCary Sumrall) Holifield along with 3 brothers. So the signs point to this Benjamin Sumrall being the son of Elisha Sumrall. On his World War I draft registration card, Jesse Sumrall gave his full name as Jesse Marion Sumrall, whereas some genealogies cite his middle name as “Milton.” He listed his date of birth as 14 November 1881 (3 years older than on the 1900 census). Jesse married Clara Octavia Brownlee and sometime after the 1940 census moved his family to Mobile, AL where he died on 18 July 1980. He is buried Oakland Grove Baptist Cemetery in Laurel, MS. Obtaining a copy of his Alabama Death Certificate might provide further evidence of the connection. As for the two Benjamin Sumrall(s), both seem to have died in the 1920s. I believe the one who married Sabra is the one who died 11 September 1923 and is buried in Springhill Cemetery, Laurel, MS. Thus far I have been unable to find a death certificate for either man. As I indicated to Kathy, it seems likely that the Benjamin Sumrall who was the son of Elijah and Nancy is buried with his wife in a lost family plot. Ed, the detail and clarity you provide is, once again, amazing! Thank you for your knowledge and help! Separating the two Benjamin Sumrall’s and acknowledging that there were indeed two individuals is so helpful! Thank you! Thank you! Ed, thank you so much for the detailed info on the two Benjamins and confirming son Jesse. You are always so thorough and always provide very useful information. Again, thank you so much. One more question, Ed. Is Mary Ann’s father Joshua the same as Joshua married to Chloe McCary? If not, how does Joshua connect? Thanks. One last set of comments about the two men named Benjamin Sumrall who both lived in Jones County ca 1850-1924. If you have any further questions, or would like an image file of the death certificates I describe below, request my email from Vikki Bynum. A trip to the Mississippi Archives clarified that there is a death certificate for Benjamin FRANKLIN Sumrall. As suspected, he is the one who died on 11 September 1923. His parents were recorded as “H. Levy Sumrall” (Harmon Levi Sumrall) and “Bethany Shotts.” A further bit of evidence turned up in the Jones County cemetery transcriptions which have this Benjamin buried beside wife Sabra Jane Collins Sumrall, who died 5 March 1912. Both were interred at Springhill Baptist Church cemetery. 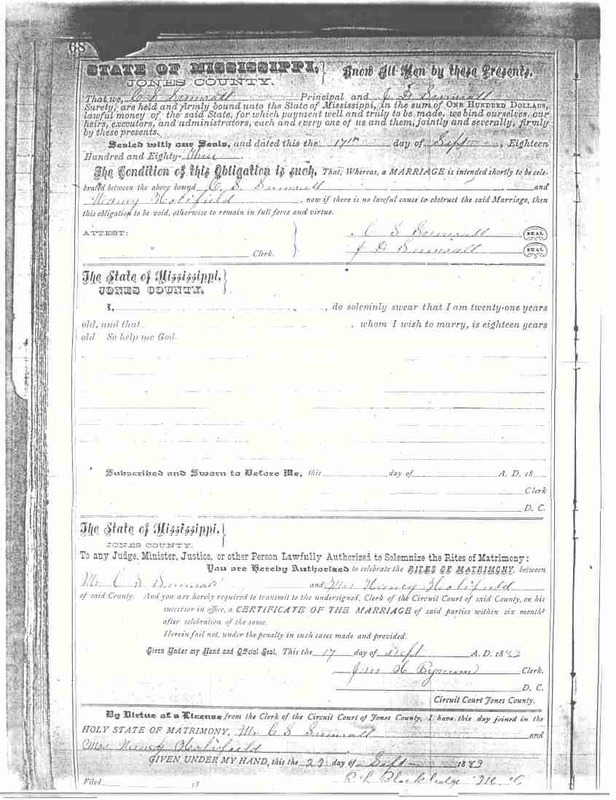 The death certificate that remains elusive is one for Benjamin R. Sumrall, the son of Elisha and Nancy McCary Sumrall. He was enumerated on the 1920 census, but his wife’s death certificate from 12 October 1924 listed her as a widow. So Benjamin R. Sumrall apparently died between February 1920 (when the census enumeration was concluded) and October 1924. Kathy had told me that the wife of Benjamin R. Sumrall died in 1924. The death date for “Mary Ann Sumrall” was 12 October 1924. Her parents were listed as “Josh Holifield” and “Mary Craft.” Sadly, at least six Ancestry public trees cite Find-A-Grave to confuse her with Mary E. Anderson Sumrall, wife of Henry E. Sumrall, who died in 1943 – this despite accurate information on the Find-A-Grave page. The Joshua Holifield who married Chloe McCary was not the father of Mary Ann. Per the 1900 census for Joshua and Chloe, he was born in Apr 1844 in Mississippi. The father of Mary Ann was born ca 1818 in South Carolina. The exact nature of the relationship of Moses, Joshua 1, and Joshua 2 is unknown to me. Thank you again and again. We went to the archives and got the death certificate copies while there but I appreciate your research more than you know. We have done some additional research including locating deed records that provided the location of the original Sumrall property in Myrick. I’m a bit hesitant to contact the current owners but I intend to ask if they have seen any evidence of grave markers on the land. It all appears to be wooded so it’s entirely possible that markers wouldn’t have even been noticed. In addition, there are a couple of unidentified adult graves at the Clarke Cemetery in Myrick. Since there are several Sumrall decendants buried there it is worth checking to see if any records are available. I was there this week and hope to contact the cemetery caretakers to see if other records might be available. With your vast knowledge and experience, if you have any other suggestions I would be happy to try. We too have seen so many records that confuse the two Benjamin’s. I feel if I could at least locate a burial site it would help. I realize that there are times that these mysteries aren’t solved but I want to make every effort to try. Anybody have any information on the parents and further ancestors/relatives of Alex Sumrall (1880-1943) married to Alice McCree Sumrall (1881-1946). They are buried at Quitman Cemetary in Clarke County, MS. Some sleuthing on Ancestry shows an “Alex Robert Sumrall” registered for the WWI draft in Sept 1918. He gave his age as 37, his year of birth as 1881, and his nearest relative as “Alice Sumrall.” Going back from there, the 1910 census of Clarke County shows “Robert A. Sumrall” age 28 with wife Alice and daughter Elsie age 1. The 1900 census of Jasper County has “Alexandre Sumral” age 18 in the household of John H. Sumrall, age 45, and wife Malisa, age 44. The 1890 census records were destroyed in a fire, but in 1880 a John Sumerall and wife Lissa were enumerated in Jasper County — with ages that match the 1900 couple. Ancestry transcribed their surname as “Lemerall” but users have submitted corrections. Find-A-Grave has an entry for “J.H. Sumrall” as buried in Rose Hill Cemetery, Jasper County — however, there is no photograph. If the year of his death (1926) is correct, there should be a MS death certificate. Further Ancestry links suggest John H. Sumrall was a son of John and Elisabeth Sumrall, found on the 1860 in Jasper County, ages 28 and 31 respectively. Hope this proves a useful trail. Thanks Ed and now I’ve found some more interesting twists. I’ve got a baptismal certificate from St. Michael’s Church listing the parents of Alex Robert Sumrall being John Sumrall and Sara Ann Rogers. John Howard Sumrall and Sara Ann Rogers Sumrall are buried at Old Phalti Cemetery around Paulding, Jasper County, Mississippi. The birth and death dates of of John Howard Sumrall and the J.H. Sumrall listed at Rose Hill are VERY close. I can’t find any trace of any Lissa or Malissa outside the census data (other than John H. Sumrall had an aunt near his age with the middle name of Malissa but she got married and had children) so this is quite a mystery still. Just need to see if that gravestone in Rose Hill is really there as we don’t have a picture yet and then figure out who Lissa/Malissa is? I note that the memorial for J.H. Sumrall at Rose Hill has been removed from Find-A-Grave and saw on the same site the actual photograph of the tombstone of “John Howard Sumrall” at Old Phalti. If you wish to contact me further, request my email from moderator Vikki Bynum. You can let me know here if you’d like Ed’s email info, ssumrall.